Finding the best coach pitch bat on the planet is surprisingly more difficult than we first imagined. Turns out, there at least 20 legitimate performance-based coach pitch bats in the space. After considerable game and cage testing, conversations with parents and players who play and reading a number of online ratings, we think the Marucci CAT 7 Junior Big Barrel is the best coach pitch bat. Kids absolutely loved the sound and feel from this big barreled aluminum bat. Parents, although not excited about the higher price point, loved the durability. Price check: Amazon.com. Sizing on the JBB CAT 7 smallest size 25/15. 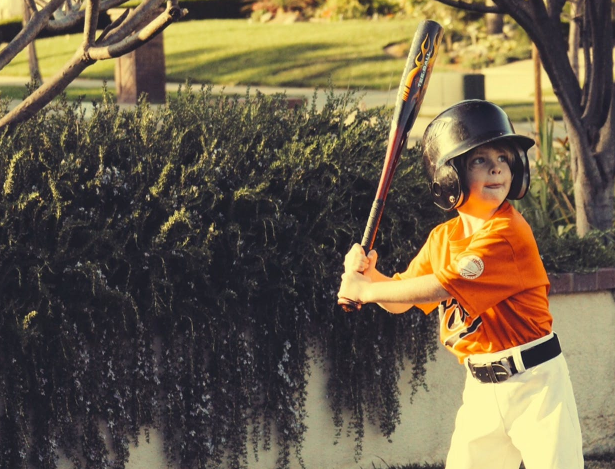 Fifteen ounce bats are recommended for 5 to 6 year olds. The bat also comes in a 27/17 which would work well for the bigger 7 year old up to 8 years of age. There are very few very light swinging USA Bats. But, if any fits the bill, it is the 2018 Rawlings Threat. This is an ultra light swinging drop 12 that should probably be categorized as a drop 13. It comes in as short a size as a 27 so expect a 15 ounce bat which will feel more like a drop 14. It is a 2 5/8 barrel. Price check: Amazon.com. Easton’s single piece aluminum S3 JBB gets great ratings from parents and players alike. Folks love the price point, feel and brand name. It also has legitimate performance for a sub $100 bat. The 2016 version (which is green) is also a worthy buy if you can find it—which is usually at a discount for no other reason than its older. It is the same bat as the 2017 S3 pictured above. Price check: Amazon.com. Anderson makes fantastic fastpitch bats. They also make a very adorable, and tiny, coach pitch bat that has a size as small as a 27/15. (It is a drop 12). The bat doesn’t get amazing ratings from players. It is, after all, a single piece aluminum with a 2 1/4 barrel and a very light swing. This makes hand sting inevitable. But, in terms of a light swinging true fastpitch bat in the coach pitch space, this is it. Price check: Amazon.com. 2 3/4 or 2 5/8 Coach Pitch Bat? There are a number of 2 3/4 or 2 5/8 coach pitch “big barrel” bats. In theory, you want to get the biggest barrel possible. Most non USA Bat leagues, allow a 2 3/4 bat. The 2 5/8 bats are left overs from days gone by (when USSSA 2 5/8 1.15 BPF bats made sense. In other words, get a 2 3/4 if you can. If you’re in a USA Bat league then the 2 5/8 (with a USA Bat stamp) must suffice. In 2018 very few bats made a light swinging USA Bat. It is why we like, and suggest, the Rawlings Threat as it is a drop 12. Junior big barrel bats are often referred to as coach pitch bats. Big Barrel bats have a big barrel like the JBB and coach pitch bats, but they are rated for higher pitch speeds. JBB/Coach Pitch bats are big barreled but are rated for slow pitch speeds and are often in the very short sizes (like 25, 26 and 27 inch). What Makes the Best Coach Pitch Bat? -More barrel size gives more chances to put the ball in play. But more barrel at the expense of too heavy a bat isn’t helpful for most young players. Finding a bat with as much barrel face as possible without sacrificing a low swing weight is ideal and proves the most success. Few things convince a player that he doesn’t like to hit baseballs faster than a hit that rings the hands. Bats can be designed to dampen sting. As such, the best coach pitch bat should be designed to dampen hand sting. It’s not far fetched to understand how a grown man’s confidence at the plate can seriously affect their batting and slugging percentage. Look no further than the pomp and circumstance of MLB hitting swag. That serves virtually no other purpose than that of looking good. Extending that idea to little tykes may be uncomfortably vain. But, it doesn’t make it any less adorable. Sweet looking bats, as determined by mini players, are a serious key to confidence, which in turn, is a serious key to success at the plate. Should I get a Composite Coach Pitch Bat? The main reason a composite coach pitch bat makes sense is because composite produces the lightest swing weight. Composite coach pitch bats tend toward a lighter swing weight. Aluminum alloy equivalents tend to swing heavier. There are some exceptions to this but on the whole it stands true. It should be noted, however, a decrease in swing weight is achieved more easily by shortening the bat’s length. For example, if 27 inch aluminum coach pitch bat is too heavy for a particular player, then dropping to a 26 or 25 inch will give them a better chance at the appropriate swing weight. At least, a better chance then just changing from aluminum to composite. Some may argue a composite coach pitch bat may be appropriate for that advanced 7 or 8 year old. Some, it is true, can wield some power. If such a player does exist, and we am sure they do, then they shouldn’t waste their time on a bat rated for 35 mph pitches. There are plenty of bats in the 2 3/4 ‘Big Barrel’ or ‘Senior League Space’. These will work for them just fine and we recommend that route. Previous: Previous post: Best Composite Wood Bat | Baum, CornDogs or the L180?